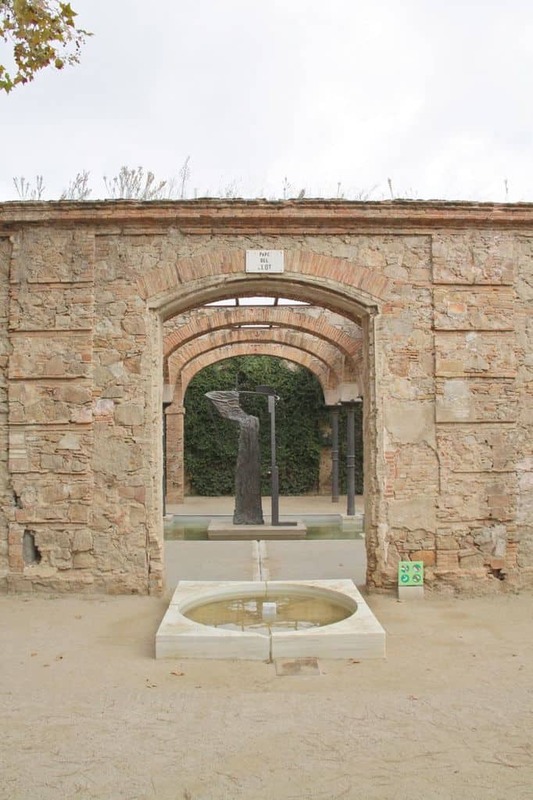 If you want to feel wistful and romantic on your afternoon stroll in Barcelona, there’s a special park for you. 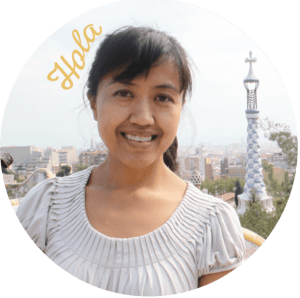 No, it’s not Parc Güell. 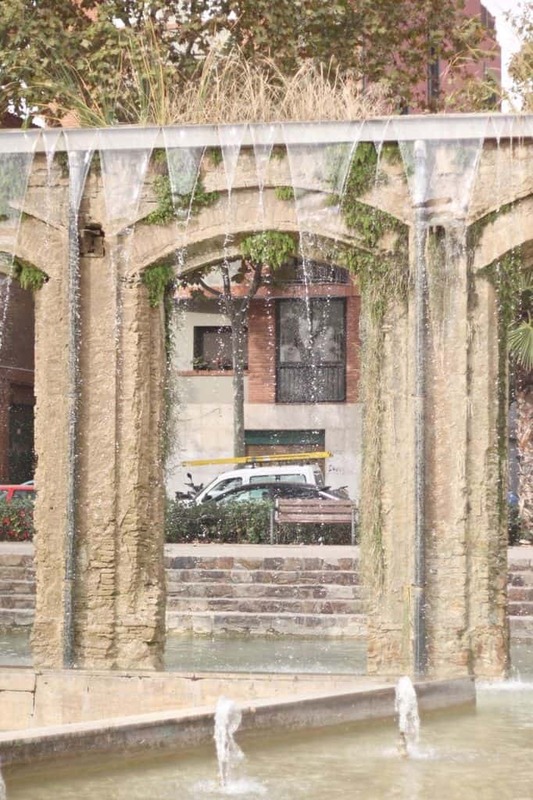 It’s Parc del Clot in Sant Martí. And it will bring you back to the nostalgic Roman ages. 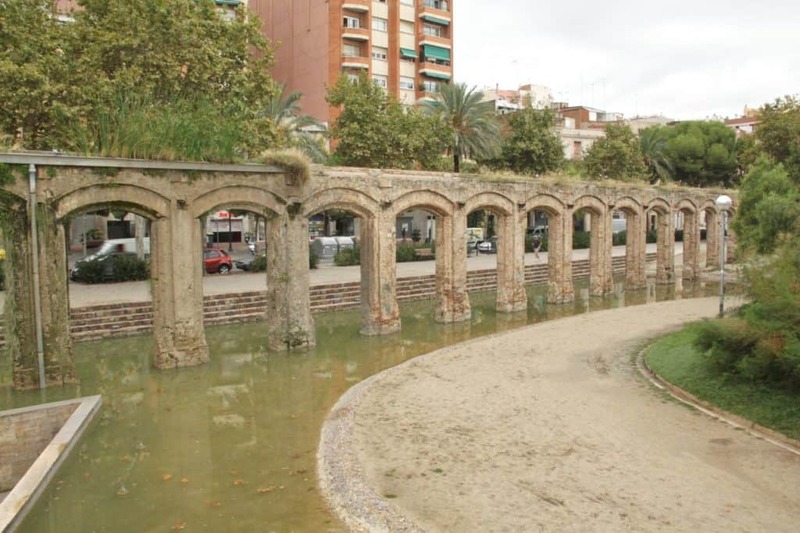 To me, this park makes me revisit the town of Segovia and its soaring arches — a 2,000-year-old aqueduct that overtakes the the old center. 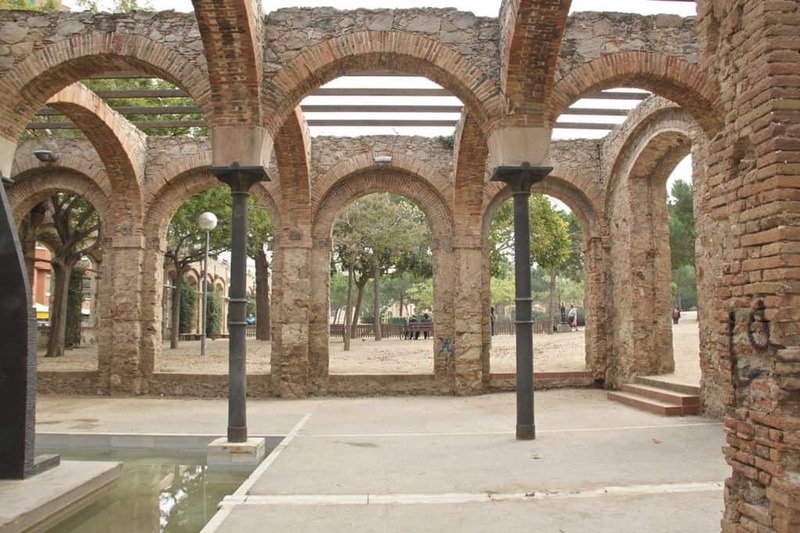 But, the arches in Parc del Clot are on a much, much smaller scale. And, I learned later it’s relatively not that old. 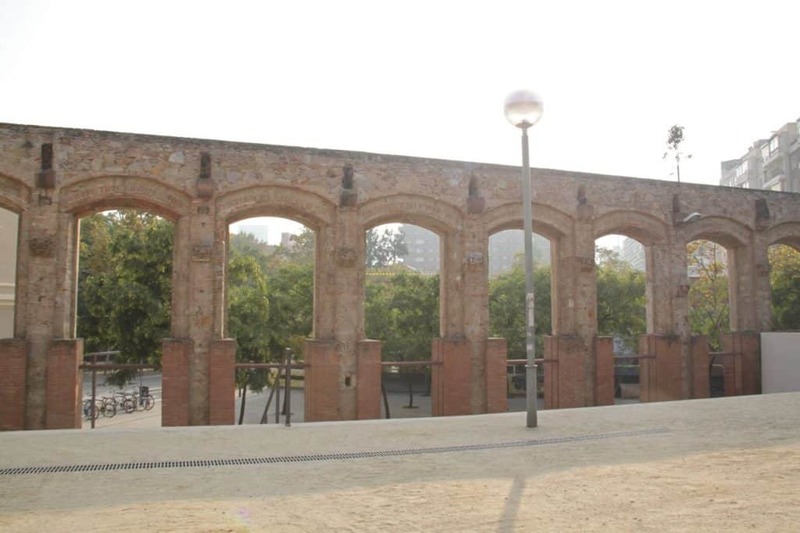 The arches are actually former walls of RENFE’s train workshop (Spain’s national railway company), which was constructed in the 19th century. New trains were built and repaired in this once-industrial area of Sant Martí. Since the workshop had long shut down, the space was abandoned. 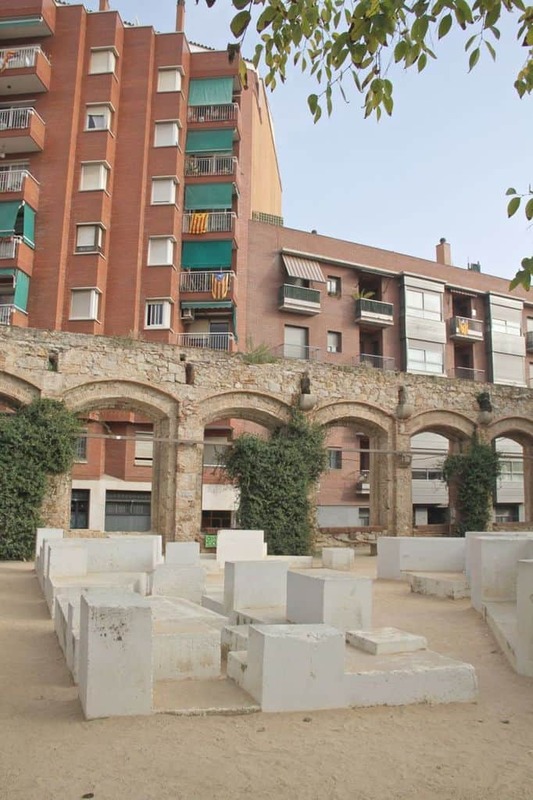 Then it was sold to the Barcelona City Council in 1972. Finally, the park was renovated in 1986. 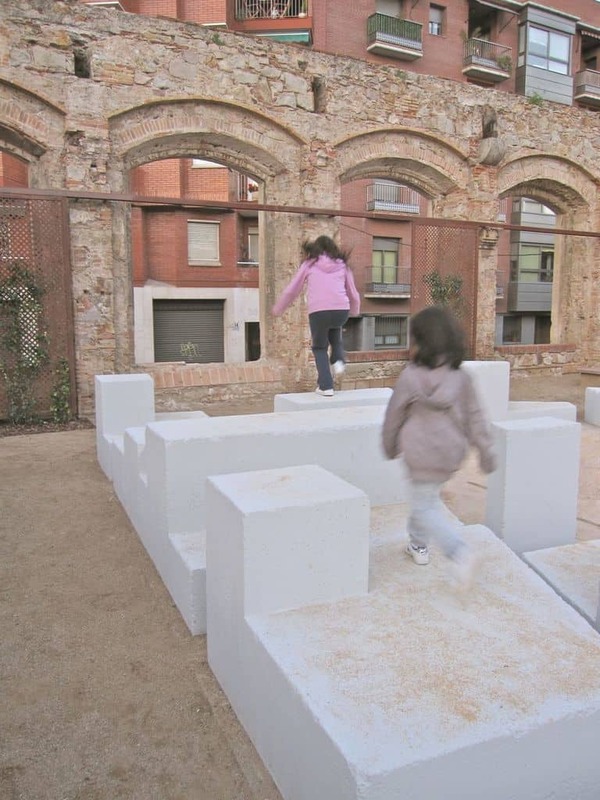 The designers decided to maintain part of the framework, the stone walls that delimit the space on different sides of the park. 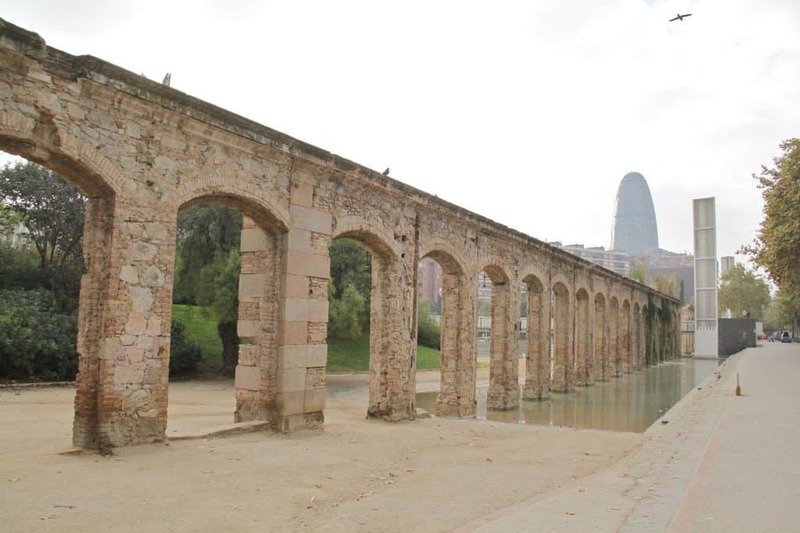 Only one of the walls was transformed into an aqueduct 25 meters long. The water cascades and trickles into this small lake. The use of this park is completely maximized. 1) It’s a connection hub between the market and the district City Hall. 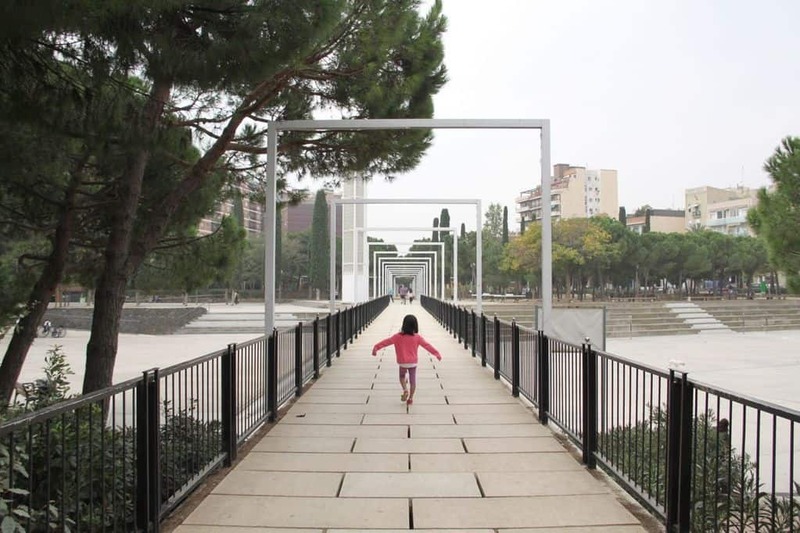 2) It joins two major city streets: Gran Via de Les Corts Catalanes and Avinguda Meridiana. 3) It has numerous services for the Clot neighbors. 4) It’s awesomely interesting. One of my favorite parts of the park are the modern “corridors”. 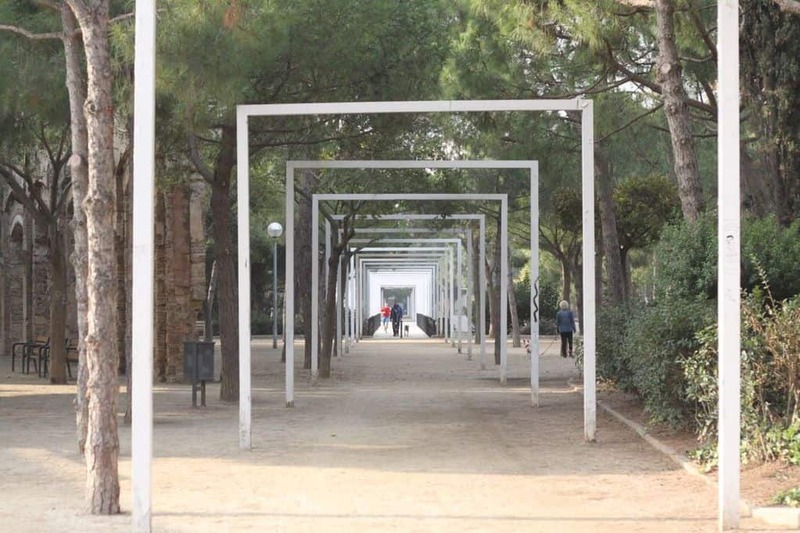 These white square metal frames form a long passageway from one side of the park to the other. It’s also multileveled. The corridor becomes an overhead crossing, where you can get a view of the esplanade, the main area below. And this is what you see on a typical weekday morning. But on the weekends, it’s packed. Kids are playing basketball or football. Retired folks are hitting racquetballs against a wall. Teenagers are perched on the steps, watching people and sharing gossip. 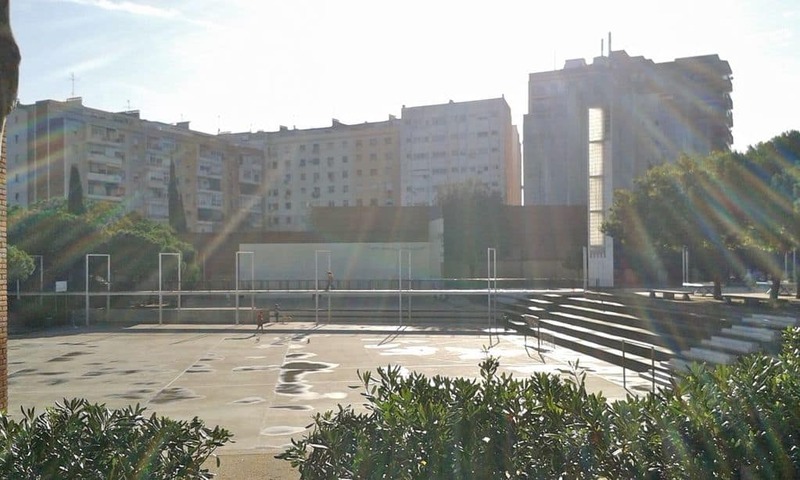 The park also has three children’s playgrounds, a dog park, a petanca court, ping pong tables, and several fountains. One one side of the park, there’s a small pavilion with a bronze sculpture in the middle. It’s by American artist, Bryan Hunt. 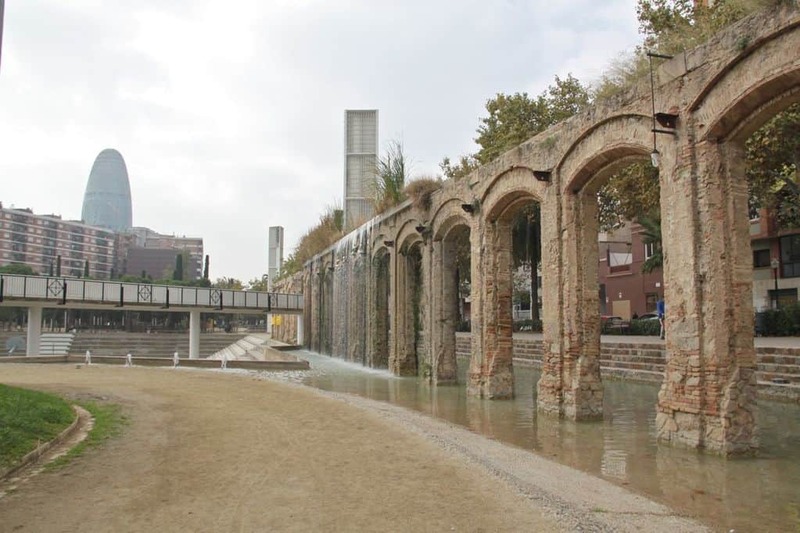 It’s the architectural elements and the varying elevations of Parc del Clot that keep you visually interested. You just can’t stop exploring. You’ll find curious landmarks to see, steps to scale, bridges to cross, and ramps to climb. It also has well-manicured grassy hills and lush Mediterranean vegetation. And let’s not forget the view of the Torre Agbar. Spectacular parks like these add to your quality of life. Don’t you agree?